From the much maligned key stage 1 screening test which asks children to sound out words such as “drall”, “halp” and “snope”, to the current embrace of the synthetic phonics model in UK schools, how to teach reading and writing is a subject of hot debate. All schools will have their own favourite phonics programme. But whether you are Floppy fans or find joy in Jolly or elsewhere, the Guardian Teacher Network has some excellent resources to complement phonics work in school and at home and help your pupils to learn the most important lessons of their lives. guide to the game here. Teach your monster to read is set in a world with eight islands and children have to demonstrate knowledge of four graphemes to complete each island and move on to the next one. There are lots of exciting things to do on the way which allow the player to practice important elements of reading and the game’s primary aim to to develop children’s speed and accuracy of grapheme/letter recognition. Children can get to grips with graphemes in this ready-made “ir, ue, aw, ue, wh, ph” PowerPoint with sounds and action buttons, and here is the “ay, ou, ie, ea, oy” version. These attractive ready-to-print 200 high frequency words from phonics letters and sounds will also be useful in the primary classroom. This interactive online lesson on reading CCVC and CVCC words will help children blend phonemes in words including clusters that need to be treated as a single sound when blending. For those who want to prepare for the year 1 phonics screening test, this set of 40 cards containing both real and pseudo words (the latter illustrated with creative pictures that could lead to some new words being incorporated into the English language – perhaps an ulf will become one of your pupils’ favorite animals, or even a vap). The words are based on the sample materials provided by the STA. If you go to www.primarytools.co.uk you can find a really useful electronic tracking spreadsheet for a class of 33 pupils which is colour coded and automatically adds up the score per pupil and per word. More phonics test practice can be had using this literacy assessment tool. Thanks to Alan Davies from Thrass for sharing these English phonics guide and check guidance notes for teachers. The resource contains some excellent ideas for class teaching for learners of all ages and abilities, including gifted and talented, those with learning difficulties and EAL students – with guidance on helping learners say the right sound when they read and choose the right letters when they spell. For gorgeous teaching resources that link phonics work with animal topics find E is for Elephant and other animals and S is for Seagulls and other animals. This phonics bingo game is fun and perfect for reinforcing teaching on phonics and words. Internet phenomenon and full-time primary school teacher Mr Thorne, of Mr Thorne Does Phonics fame, is well worth investigating. His fabulously entertaining and educational videos, where you can get to know Geraldine the learning Giraffe a little better, can be found on YouTube. For iPad fans, you can download the Mr Thorne Does Phonics: letters and sounds app. Also recommended is the the Ladybird – I’m Ready for phonics app which covers, with the help of Captain Comet, initial letter sounds, phonemes, graphemes and all those tricky words that can cause even the most competent pupil to stumble. 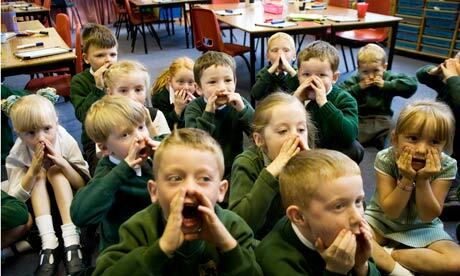 There are short videos of the phonemes being said and the pupils can record themselves too. Macrophonics offers a cute phonics alphabet for use in school and at home. Pupils can tap the letter to hear it and then there is a short fun film showing the word in action offering some context for it. It is free for the iPad. Funimal Phonics is a great app for pupils first getting to grips with their letter sounds. Burt’s Reading Recovery scheme has been used by many schools to provide extra consolidation for pupils in key stage 2 who are struggling with reading, based on the letters and sounds system. Find some really useful worksheets for Module 1, Module 2, which introduce the five vowel sounds, Module 3 which introduces blending, Module 4 which blends consonants and vowel digraphs and finally Module 5 which covers more advanced blends. There are practitioners who advocate alternative methods to the current phonics model taught in schools. Mona McNee is an 89-year-old reading teacher and campaigner who developed the Step by Step decoding system of phonics based on 26 letters and without flash cards. Rather than letters and sounds ai, ee, igh, oa, oo, Mona McNees’ method uses the rule that single letters can say the long vowels, for example the magic e rat/rate, them/e, pip/e, cut/e. Her method has some passionate supporters and many people, including prisoners who never learned to read when they were at school, have mastered reading through her resources. Her motivation to keep banging the drum over so many years? “The humiliation of not learning to read does not bear thinking about.” So here are some alternative resources which may be of particular use for teachers who are working with children or adults who haven’t learned to read the first time round. One of Mona McNee’s most ardent fans, who taught his three children to read using a tattered copy of her original Step by Step manual, created phonics4free.org to share the work. Here is lesson one of Mona McNee’s system with supporting games Snakes and ladders 1 and Snakes and ladders 2. For those who want to do some more research into phonics and beyond, see the Rooted in Reading passport report which looks at some pioneering work done by the CfBT Education Trust with Lincolnshire County council. Their reading promotion project combines high quality teaching of phonic work with equally high quality incentives to read for enjoyment and information. The report shows that complementary incentives can help children develop a healthy appetite for reading by rewarding their success as they progress from beginners to skilled readers as they progress through 12 reading passports, and makes fascinating reading.